Gresley Old Hall is a Grade 11 listed property found in Swadlincote Derbyshire, well known for its haunted reputation, this is building that looks as if time has stood still, as it lays abandoned and desolate. With creaking, ominous and original staircases leading up to atmospheric and creepy spooky rooms, this is sure to tick all the right boxes for those seeking a night of terror and fear. 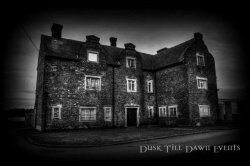 Many visitors have given reports of their findings here, strangely the spirit of a young girl has been sensed within the building time after time and some believe that her image was actually captured on camera during an overnight investigation.